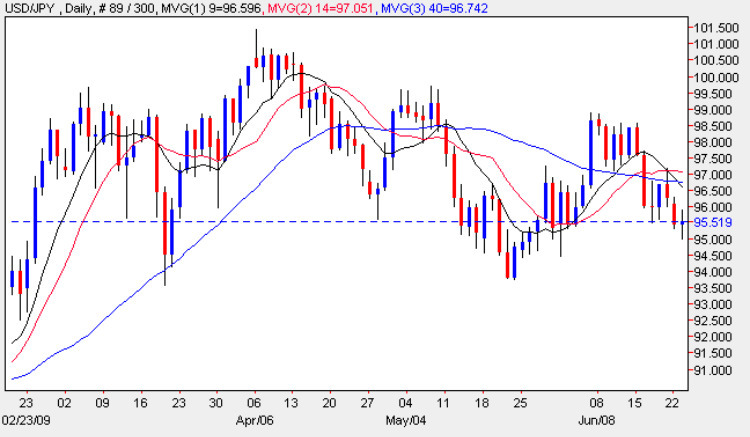 Yesterday’s wide spread down bar confirmed that in an otherwise messy picture, that the general bias for the yen to dollar pair is probably bearish and this may well be where we finally see a break below the 94 price point mentioned in several previous daily commentaries for the pair. We should also note that the open of yesterday was gapped down from Friday’s close and in addition the 9 day moving average has now crossed the 40 day adding further to this downside pressure. Naturally until we see this confirmed with a clear break below the 94 price region coupled with all three moving averages pointing lower then there will always be an element of doubt, as the price action in the past three months has been volatile, unpredictable and tedious in the extreme. Indeed it would come as no great surprise the pair reverse on a sixpence (or dime). Today sees all the items of fundamental news on the economic calendar refer solely to the US where we have data relating to the housing market. Details of this can be found on the Eurodollar fundamental site.